Our marketing partner, Green & Gold Macadamias, is focused on building a sustainable market for the future. This is supported by a strategic network of processors that ensures year-round supply stability for customers. 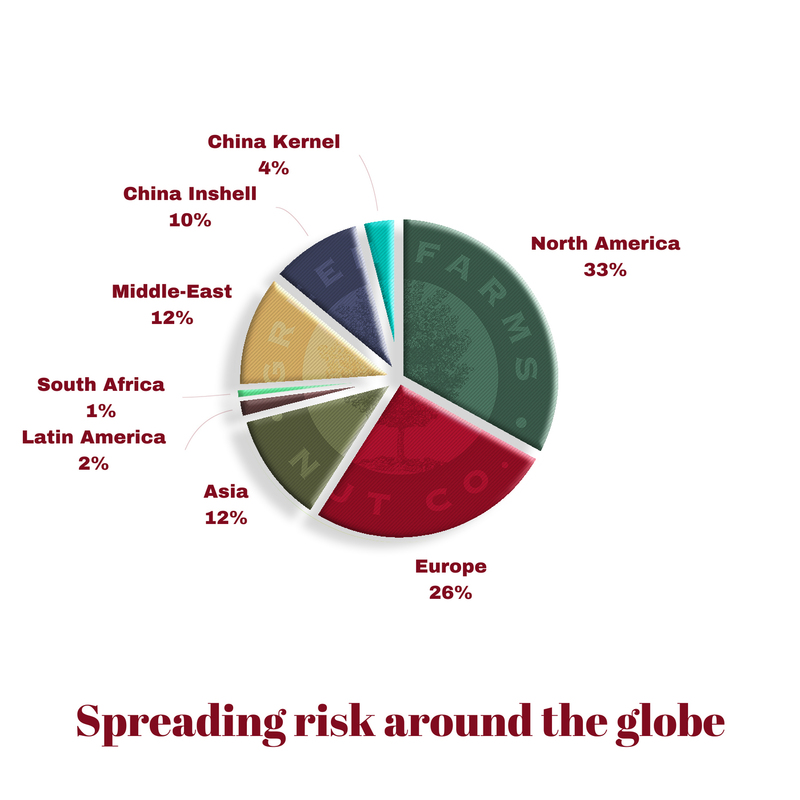 They sell in every global market and this approach manages risk on behalf of farmers. Their processors are based in Australia, South Africa, Brazil, and Malawi. All manufacturing facilities are regularly audited by independent authorities to ensure compliance, and to guarantee food safety and consistency in product grade, quality, and specifications. Our values include inclusivity and building community engagement and we are part of a number of emerging farming projects. Ncera, Transkei: we are partnered with and contributed financially to this highly successful for-profit social enterprise. The community has for nine years run a government-backed macadamia nut farming initiative of 700 hectares, with further expansion plans in place for future growth. Vhembe project, Limpopo: a co-op of farmers with about 350 members. We have funded the project which supports 22 emerging macadamia farmers in the region. And work with them to build a profitable farming operation as well as develop initiatives like a creche, computer skills training and dressmaking. Emerging farmer workshops: bi-monthly gatherings hosted throughout the year are well attended sessions where emerging macadamia nut farmers gather together to share best practice. Springfield project: our farm, Springfield Farm in Limpopo draws many of its workers from the Valdezia community. Funds are available to the local football team for facilities, clothes and registration fees required by the South African Football Association. Transport for away fixtures and end of year socials is provided. Our family has weathered many farming seasons, and understand how tough it can be. We have been farming on and around the slopes of the Soutpansberg mountains in Limpopo (where macadamia farming starting in South Africa) since the 1970’s. This makes us one of the oldest and most established macadamia farmers in the country. Starting with a modest 44 hectares over 200 hectares macadamia orchards are currently farmed with further expansion planned. Our strategy is to buy and lease good agricultural land. Our farming business includes macadamias, avocados, litchis and timber.